Curling officially started in Acton in February of 1962. At that time, not many of the founding members knew how to curl, or for that matter knew much about the sport itself. The CBC’s limited telecasts of the Macdonald’s Brier were the inspiration for many, and those who were rookies learned from those that had curled before. In those first years, curling games were played Monday and Tuesday afternoons and evenings at the old arena at the fairgrounds. It was after the Club’s very first bonspiel that a vote was taken to work towards building a new rink of their very own. Also, in those early years, the Club had stones of every different size and weight. It was not until just before the new Club was built that a new, complete set of curling stones were bought. And those same stones are being used today, now with different handles on them. It was 1969 when the vision of that original nucleus came into being. The steering committee was headed by the 1968-69 Club President, John Goy, and its Treasurer, Chester Anderson. The Tylers, the Ridleys and many, many more folks with trucks, hammers and shovels cleared the ground, created the foundation, poured the cement floor and built the building. Most of the Club’s construction was done by volunteers. In fact, there was such a great response by volunteers of their time and manpower, and so many donations from the citizens of Acton that the organizers were able to get the property, build the Club, buy new stones and open with a very small mortgage. Nearly every one bought shares and many of the town’s people attended fund-raising dances at the Acton Legion. After it opened, almost all of the activities of the Club continued to be done on a volunteer basis. Even tips were recorded as club income. The ice man was compensated $300 for a year’s work. When John Mintern became the Club’s president in 1985, that marked the beginning of a new wave of improvements to the curling club. New ice equipment arrived, and new ideas made ice-making a new experience. Acton’s ice became known as the best around. 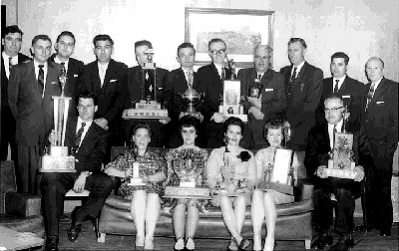 More bonspiels were organized, and John and Al McKerracher started a day-time seniors’ curling program, which remains very successful to this day. Many thanks to Willa Hewitt and Del Hickling for this trip down memory lane.